The HAHN+KOLB Academy will provide you with a knowledge advantage over your competitors thanks to the practice-oriented seminars. Benefit from our experts' wealth of knowledge in a pleasant atmosphere and a professional environment. 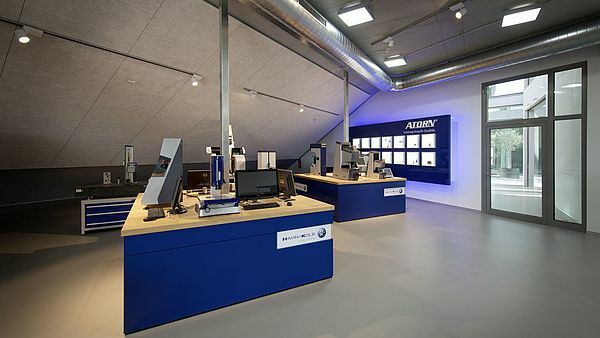 We offer fascinating presentations in the fields of chipping, measuring technology, hardness testing and cooling lubricants with a view to passing on our expertise in the form of theoretical and practical knowledge. The significance of these areas makes it all the more important to benefit the expertise offered by HAHN+KOLB and its state-of-the-art training rooms. What are the Academy's guiding principles? Application-oriented - theory tailored to practical applications. Competent - optimally trained experts and speakers. Requirements-based - bring your own workpieces so that we can discuss them as a team. Dynamic - seminars and training courses for beginners and experts. Efficient - theoretical and practical knowledge taught in small groups. Motivating - certificate of participation as evidence of learning. Customised - seminars designed to your requirements. Success-boosting - a knowledge advantage over your competitors. As well as hosting seminars, we can also organise accommodation and a fun social programme. What you learn at HAHN+KOLB's state-of-the-art Technology Centre will be immediately relevant to the work you do. Experience product highlights close up, from a range of over 60,000 articles. 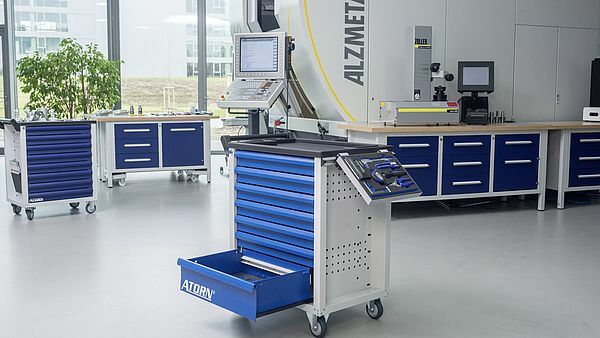 Machining tools, measuring and materials testing technology and other intriguing tools are exhibited over a total of 450 square metres. 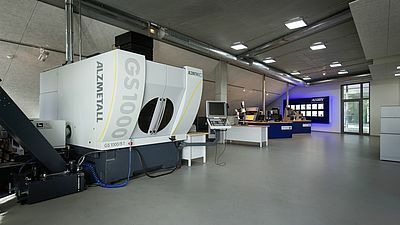 The highlight of the Technology Centre is the Alzmetall GS 600 5-axis machining centre, which bears impressive testament to the potential of high-performance machining. Take part in one of our seminars and see our highest-performing products for yourself. Take the A81 in the direction of Heilbronn. Take exit 16-Ludwigsburg-Süd and continue on the L1140 in the direction of Ludwigsburg. Please note that this is a low-emission zone. Your car must have a green sticker. > take R-Bahn R4 (in the direction of Heilbronn Hauptbahnhof) to Ludwigsburg. From there, take bus 533 (in the direction of Markgröningen Rebsteige) to Ludwigsburg Jenischstr. The Technology Centre is a five-minute walk away. > take S-Bahn S2 (in the direction of Schorndorf) to Schwabstraße, then change to S-Bahn S4 (in the direction of Backnang) and travel to Ludwigsburg. From there, take bus 430 (in the direction of Eglosheim Straßenäcker) to Ludwigsburg Osterholzalee. The Technology Centre is a five-minute walk away. > take R-Bahn R5 (in the direction of Mühlacker) to Ludwigsburg. From there, take bus 430 (in the direction of Eglosheim Straßenäcker) to Ludwigsburg Osterholzalee. The Technology Centre is a five-minute walk away. > take S-Bahn S3 (in the direction of Backnang) to Schwabstraße, then change to S-Bahn S5 (in the direction of Bietigheim-Bissingen) and travel to Ludwigsburg. From there, take bus 430 (in the direction of Eglosheim Straßenäcker) to Ludwigsburg Osterholzalee. The Technology Centre is a five-minute walk away. Download: "Experience whole new worlds of tools with HAHN+KOLB"